Zandra Rhodes and Rembrandt’s portrait of Catrina Hooghsaet, 2014. Image: National Gallery. Last week, Zandra Rhodes returned to London Fashion Week for her Spring 2016 collection. Famous for her colourful, hand-drawn prints, the bohemian cult favourite is also new to Vogue Patterns for Winter/Holiday 2015: Vogue 1472 is the first new Zandra Rhodes sewing pattern in thirty years. (Update: read a profile in Vogue Patterns magazine.) For knitters, the current issue of Rowan Knitting & Crochet has a Zandra Rhodes jacket pattern available as a free download. Zandra Rhodes sketch with yarn charts and sample garment in Katy Bevan, “Dame Zandra’s Knitting Circle” in Rowan Knitting & Crochet 58 (Winter 2015). Image: Rowan. Natalie Wood wears a screen-printed felt evening coat and silk chiffon dress, both by Zandra Rhodes. Vogue, January 1970. Photo: Gianni Penati. Image: Youthquakers. Rhodes became known as the Princess of Punk following her Spring 1977 torn and safety-pinned Conceptual Chic collection, which was partly inspired by Schiaparelli’s Tears dress. A wedding dress and dress from Zandra Rhodes’ Spring 1977 collection at the PUNK: Chaos to Couture exhibit, 2014. Image: Metropolitan Museum of Art. 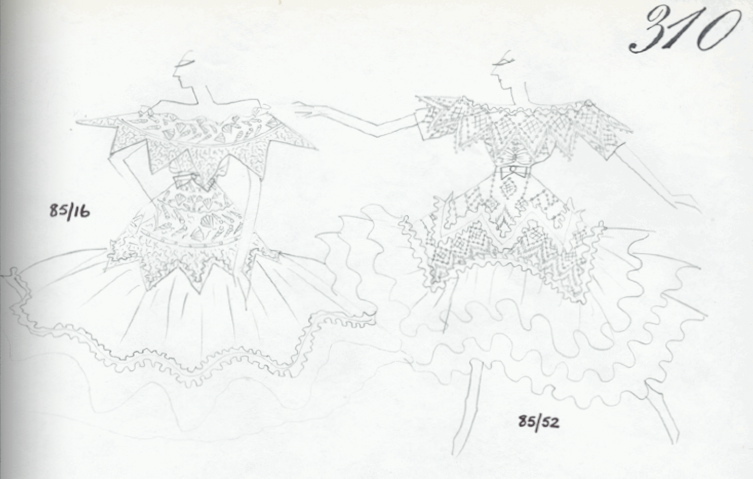 Zandra Rhodes sketch for Princes Diana. Image: SDNews. Style 4399 by Zandra Rhodes (1985) Image: Etsy. 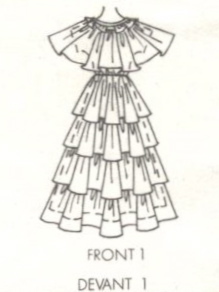 Here’s the envelope description: Misses’ Lined Wedding Dress or Evening Dress in Two Lengths — Dress has shoulder yoke with serrated frill and pointed cape effect on bodice. Skirt has elasticated waistline. Model 1 bead trim is used on yoke and neck tie. 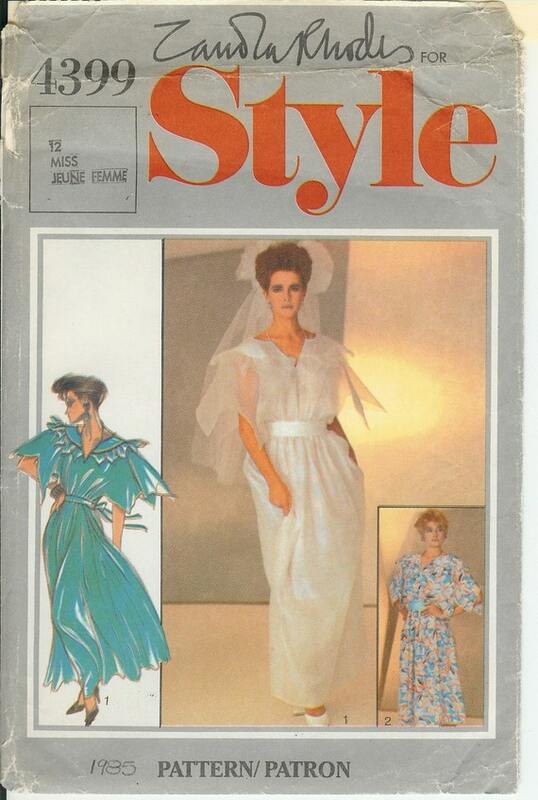 Suggested fabrics: Lightweight silk types, crepe de chine, chiffon, shantung, lace, voile, batiste, organza. Lining: Jap silk, crepe de chine. Trim: wide ribbon and pearl beading or narrow ribbon. 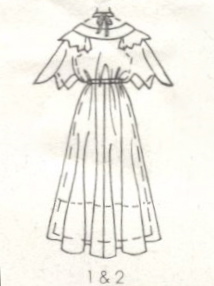 The envelope description reads: Misses’ Half-Lined Wedding Dress or Bridesmaid’s Dress and Petticoat — Dress has flounced bodice with elasticated waist. Skirt has layered net frills, with gathered net and ribbon trim. Bride and bridesmaid’s dress has petticoat in fabric and net. 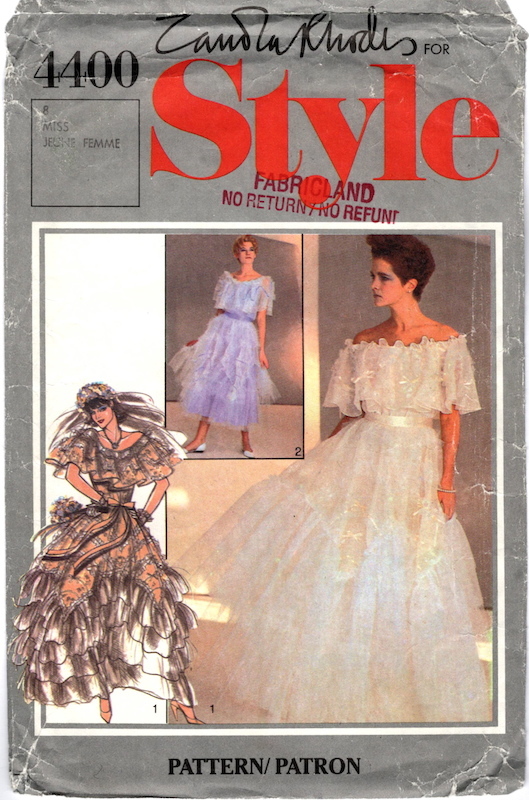 Suggested fabrics: Dress, Models 1 and 2: Organza, voile, silk or synthetic sheers, lightweight lace. Lining: silk types, taffeta, satin (nap irrelevant). Net or tulle: silk, nylon. Trim: wide ribbon, sequin trim, narrow ribbon. You can see the same pattern with updated envelope here. Here’s the envelope description: Misses’ Dress in Two Lengths — Dress has fitted bodice with elasticated waistline. 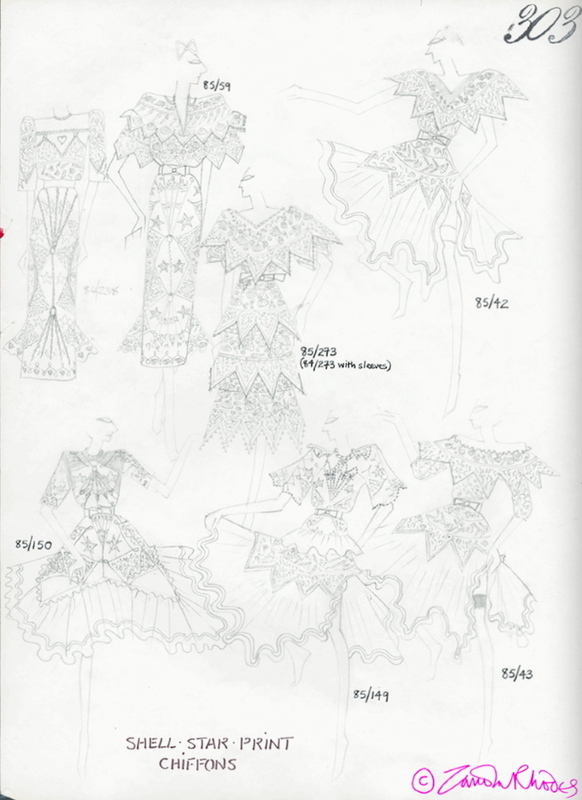 Models 1 and 3 have bodice frill to waistline. Model 2 has shorter bodice frill. 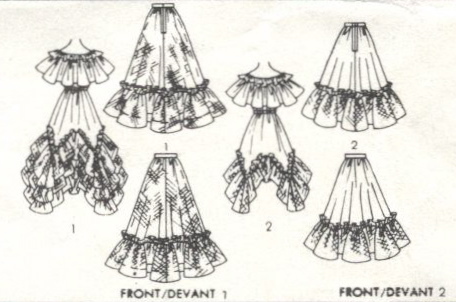 Models 1 and 2 have four-tiered skirt flounce. Model 3 has three-tiered skirt flounce. 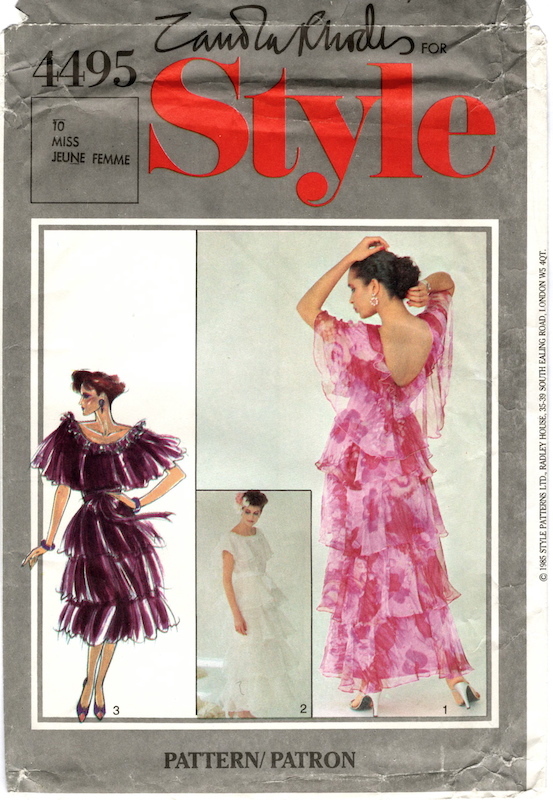 Suggested fabrics: Chiffon, georgette, voile, silk or synthetic sheers, organza. Also: lightweight lining fabric. Trim: wide ribbon; pearl trim (views 1 and 2). Zandra Rhodes Spring/Summer 1985 collection. Image: UCA Library. The trim and fabric specifications are catalogues of girliness: lightweight, floaty fabrics to be trimmed with the ribbon, sequins, and pearls. 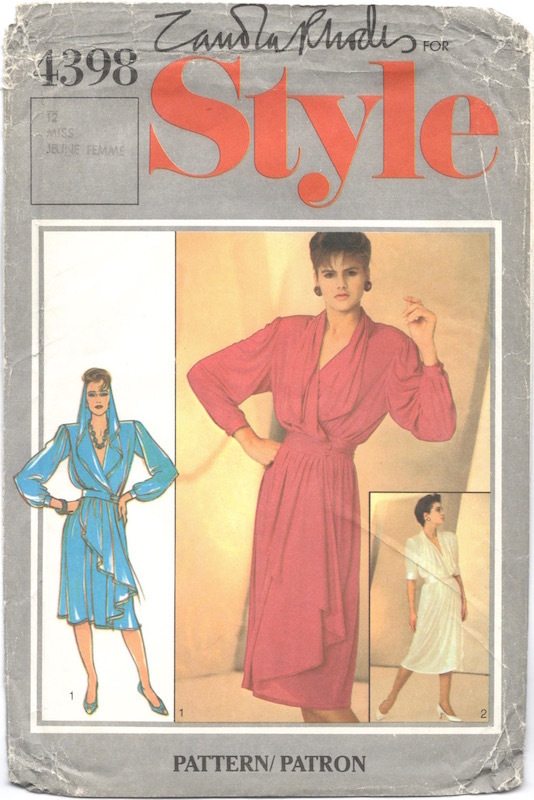 I love how Style 4495 suggests lining fabric as an alternative—perhaps with a budget-conscious youth market in mind. For more on Zandra Rhodes, see the V&A’s article. She runs (and I think lives above) the Fashion and Textile museum in Bermondsey. With any luck there’ll also be a caftan or two!